The Harman XXV pellet stove is designed to look like a traditional woodburner, and it has a top vent option which joins to six inch chimney connector flue pipe for an even more authentic look. This is a very quiet stove when operating. As well as the normal top accordion heat exchanger, the fireback is also part of the heat exchange system. This stove gives 50,000 btu. and is capable of heating an area of 1,700 square feet. Available in five colours, (see below for details), the Harman XXV has a glass hopper lid to allow assessment of the fuel situation at a glance. It has a mirror glass viewing window which permits a good fire view when the stove is operating. When the stove is off, the mirror glass presents a reflective surface. The cast iron body is nicely detailed with oak leaf patterns on the side panels and air grill. The large ash pan, which only needs emptying after a ton of pellets, has a built in carrying handle. Convection Blower Capacity 150 cfm. Thermostat Compatible Can be added, but the onboard sensors mean it probably won't be needed. Window Size 16 in. by 11 in. 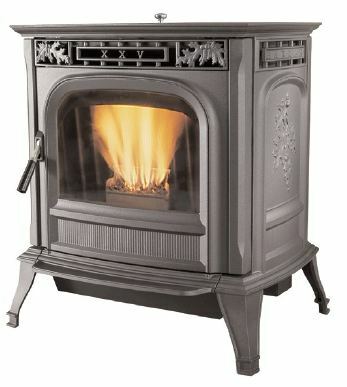 If you would like to leave a review of the Harman XXV pellet stove, please use the form on the contact page.